During the first public reading by the nonprofit ArtsReach, children and adolescents paraded past the podium, one by one, to deliver their original stories and poems in firm, clear voices. The little girls wore dresses, one of fringed leather. Their hair was done up. The boys dressed in jeans. ArtsReach had completed its second year delivering writing programs to schools in the Yaqui and Tohono O’odham communities of southern Arizona. The reading was the 1989 Tucson Poetry Festival, the site a basement auditorium in the old YWCA. The children’s shirts and dresses reflected off the scuffed, glossy black stage floor. Behind the podium a dangling movie screen swayed irrelevantly in the breeze from an evaporative cooler. After every story or poem the audience’s applause echoed. Most were family members of the readers. Many gifts passed from readers to listeners: a screaming wind that talked to the poet and helped her work, cattle stampeding through the sky, home-made tortillas. A first-grader asked, “How did rivers become? Did people make animals, or God?” A poet evoked his ancestors “racing with time, playing among the stars.” Imagining the invention of mini-skirts, a reader proudly wore her own. A poet described the sacred Yaqui deer dancer-maaso-jumping “up and down, better, lighter.” He knew the feeling because he danced maaso himself, in his village. The MC was my younger self, resolutely uncharismatic as always. I’m not relying on memory. I have the videotape. In some cases, the self watching the video can foretell the future. I know that one tiny girl will grow up to read her poetry at the Smithsonian Institute’s Museum of the American Indian, in New York City, and her mother will serve on ArtsReach’s Board of Directors. Another will write me letters in her looping, eight-year old handwriting, sprinkled with glitter. A stumpy, grinning boy will greet me years later during Yaqui Easter, handsome, towering, and I won’t know who he is until he tells me his name. Another boy will marry and then commit a terrible crime. Husky-voiced Andrianna Escalante will become the first profile in this book. 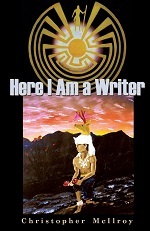 Here I Am a Writer is about the writing life, not among professional authors, but Native American students who in most cases encountered creative writing through ArtsReach. Accidental writers, one could say, some only briefly writers-all left a published record, reproduced in this book. They since have grown into adulthood. They, and in some cases their family members, are the subjects of this retrospective. What courses have their lives taken since I met them a dozen or even twenty years ago? How lasting a mark did their writing episodes leave on them? The relationship between art and life is endlessly, fascinatingly problematic. How “true” is any piece of writing, even if it purports to be non-fiction? Is there a truth more penetrating than mere factual truth? When does writing enhance the awareness of being alive, with all its complexities? When does it substitute for living, seducing the writer away from real experience? Should one live vividly to write vividly, or is the most valuable writing life the life of the mind? Such are the paradoxes of the Native writer. What inspires me in this work is the belief that people are at their best when writing, whatever the subject matter, because each poem or story honestly written is a focus of perception, imagination, memory, emotion, intellect, spirit, all in one. Nothing else so completely captures the flux of being. For thousands of the young amateurs represented by the few profiles in Here I Am a Writer , writing began simply a classroom assignment. In response to model poems and stories, given a few deliberately sketchy directions, they were asked to write something, and they did. In some cases, that accomplishment was air to the drowning, food to the starving. An urban Tohono O’odham fifth-grader, mourning her cousin’s death, commemorated her in a poem, hand-illustrated, that helped heal her family. In sixth grade this student stopped attending school-except for one week, the ArtsReach residency. How she learned of it I don’t know, but all five days she bowed over her desk and wrote. (One of her stories was published.) Then she vanished again. For others, like Andrianna Escalante, the ArtsReach residencies uncovered a secret self. Or perhaps writing passed as no more than a happy curiosity. Jokingly, Eucario Mendez suspects he might have used his published output to prop up furniture. Writing in a language foreign, even hostile, to their ancestors, all these students left their mark. If literature is meaning made beautiful through form and expressive power-regardless of any intrinsic loveliness, ugliness, humor, sadness-the students created literature. Writing this introduction, I feel like that MC. I know you’re here for the kids, reader, as you should be. But I must impose myself a bit, impart some requisite information, before we get to the program. ArtsReach was founded by myself and two other rank novices, all white, in 1986. Mick Fedullo had taught poetry on the Akimel O’odham (Pima) reservation since 1979, the same year I was hired as a writer-in-residence by the Arizona Commission on the Arts. My wife Karen had run the circulation departments for magazines, helped launch a pre-school, and trained early childhood educators. As much as anything, I think we saw ArtsReach as an attempt to rectify glaring wrongs. Whatever its other accomplishments, the Reagan administration was not a good time for programs serving education, minorities, or the arts, which faced annual budget threats and cuts. (President Reagan was unaware that Native Americans were U.S. citizens, as a speech overseas revealed.) Even as Mick’s students produced poems so revelatory that they were published in daily newspapers, from the nearby Arizona Republic, in Phoenix, to the Frankfurter Rundschau, in Germany, and read aloud to prestigious national conferences, the young Native authors remained generally ignored, often despised, even by their own classroom teachers. (“These kids can’t write. And they would never stand up and read their work in public. They’re too shy.” And much, much worse. ) It was infuriating. While educators, none of us three had special qualifications (whatever those might be) for serving Native communities. Twenty years have not dispelled the sensation of being out of my depth, facing the culture and experience of Native people. I continue to feel perpetually off-balance. I must enjoy that sensation. Our cumulative expertise in managing and funding a non-profit corporation was zero. Only beer, I’m afraid, gave us the audacity to presume we were the people to accomplish such a thing. One evening in 1986, our talk turned to Mick’s students, their remarkable talents in the midst of an alien, imposed educational system. Sipping our brews in the living room of Mick’s apartment, we decided Something Must Be Done. We were indignant. We were eloquent. We were visionary. (Or so it seemed.) And suddenly, we were ArtsReach, though we hadn’t named it yet. What an irresistible idea, applying the arts-in-education model to these unheard Native voices; funders would simply throw money at it. Yes. Well. ArtsReach lived out its first decade in Karen’s and my home because it couldn’t afford an office. Our financial status might be summed up in one image: Karen addressing a row of urinals, pleading for money, because a local business group happened to be meeting in a plumbing supply shop. As to my cultural expertise, during my first residency with O’odham primary school students, I told a delightful Pima tale of how the rattlesnake got his fangs, only to learn that such stories, as well as the mention of rattlesnakes, were forbidden outside of winter. I immediately fell ill for two weeks, either from the spiritual transgression or my guilt. Somehow, however, ArtsReach survived. During its first twenty years it engaged upwards of 10,000 students in the quest of imaginative writing. The largest number were Native, the others primarily Hispanic but also white, African-American, and Asian-American. Over a thousand have read their creations at the University of Arizona, the Yaqui and Tohono O’odham government complexes, the National Indian Education Association Conference, and numerous other venues. Yet more have been published in the ArtsReach annual, Dancing with the Wind. The list of Native authors who have volunteered as guest editors is astonishing. I must name them all: Sherman Alexie, Debra Magpie Earling, Joy Harjo (twice), Danny Lopez, N. Scott Momaday, Irvin Morris, Darryl Noble, Simon Ortiz (twice), Leslie Marmon Silko, Luci Tapahonso, Laura Tohe, Franci Washburn, Darryl Babe Wilson, Ofelia Zepeda (twice). Hundreds of teachers, administrators, tribal leaders, and others helped carry ArtsReach those twenty years. Nine different directors have served, and dozens of board members. Over twenty instructors have worked in the field, just under half of them Native. ArtsReach never did master the fundraising game, though. After constant financial struggles, it merged in 2007 with the Tucson Indian Center, where it continues as a TIC program. “Diversity” may be a cliched buzzword, but it’s also responsible for the ArtsReach programs’ enduring popularity. The noted author Mao Zedong (Little Red Book), famously declared, “Let a hundred flowers bloom.” Unfortunately, Mao is also remembered as a mass murderer, a caution against equating writing with virtue. Writing is just writing. While I consider creating stories and poems a near-holy act, capturing as does little else our individual essences and the adventure of being alive, it doesn’t make us, the writers, saints. But Mao’s advice could apply to ArtsReach’s hands-off attitude toward its guest instructors, all practicing writers, some renowned. Let them teach their own styles. ArtsReach never has imposed guidelines, much less a curriculum, upon them. Thus Mick Fedullo might win his students’ love-and commitment to writing-by freaking them out with traditional stories such as “Cut-off Head,” or rubber snakes and fake dog poop. Darryl Babe Wilson supplied actual buckskin parchments for his students to write the final drafts of their autobiographies. “Oh, well,” I said helpfully. But Simon’s trenchant, angry observations on the Native experience had provoked the classes as no one else could. The last two days, poems poured in, many written at home. Danny Lopez, the late Tohono O’odham elder and storyteller, was prevented from teaching writing at all during one residency at the San Xavier mission school. The students demanded that he keep telling them stories, the oral literature of themselves as a people, which many never had heard. But what really is the impact of such a program? Let’s get real here, writer-guy: WHAT EFFECT DOES ARTSREACH HAVE ON TEST SCORES? I’d prefer to ask, what effect does it have on the soul, whatever that might be? But for decades I’ve considered that accountability question, which becomes ever more insistent as standardized testing dominates public education. From the beginning, I’ve believed that forging a meaningful connection, a sense of personal ownership, between students and writing has to benefit them academically. Students are more teachable, more attentive, more motivated, when they actually care about what they’ve written. They revise more willingly, which is when the most dramatic learning takes place-from content through the drab necessities of spelling and punctuation. Assessing ArtsReach’s direct impact on testing proficiency has been difficult, since that factor is inseparable from others, such as the day-to-day influence of the classroom teacher, or the vagaries of the scoring system. Occasionally, though, a natural laboratory does present itself. During the 1990’s a school whose testing scores consistently had declined incorporated an ArtsReach teacher training program. Again school scores dipped-except in writing, where they spiked. Another school saw the number of third graders passing the AIMS, Arizona’s standardized test, double from one year to the next when ArtsReach focused on personal narrative writing. Of course I want students to score well. Their success in school, as well the careers of their teachers and administrators, most of them dedicated and capable, depend on it. I’m glad to help when asked. Recently I’ve devoted residency weeks to writing directions, comparing and contrasting, or second-grade persuasions. These are valid skills. But all too often, teachers are understandably afraid-the testing culture rules through fear-to risk precious instruction time on anything else. As if stories and poems are devoid of Ideas and Content, or lack Organization, or don’t exhibit Voice, or are unconcerned with Sentence Fluency or Word Choice, or don’t depend on Conventions. Creative writing teaches skills, too. And students need it. Their lives are full to bursting, with grief, joy, yearning, rage, fear. Where can that go? Into a test prompt commanding them to describe their classroom to an imaginary pen pal? A daylong writing binge, riding that jangly adrenaline crest of the imagination, had broken my connection to the everyday, leaving me spent and dreamy. Darkness had long since fallen as I drove to the Old Pascua Yaqui village, where the silhouettes of worshippers played among the lights of food booths and the tiny, open chapel. Two uncanny beings crawled into its entrance. Though dressed as humans, torsos wrapped in blankets, one revealed the furred head and snarling teeth of a werewolf. On the other dead-white slab of face, black and red strokes formed a hideous scowl, while gigantic ears flared into delicate points, like a pig’s. The back of my neck bristled, my spine tingled. Big, weird animals were sneaking into the chapel! “Hey, Mr. Kit. Buy me a hot chocolate.” A couple of kids shaking me down for snacks dispelled the trance, and its glimpse into another world. The Yaqui (Hiaki, Yoeme) of southern Arizona are a rarity in U.S. Native history-refugees to this country, fleeing oppression elsewhere. Settled originally along the Rio Yaqui in southern Sonora, Mexico, the Yaquis repelled Spanish military invasions but permitted Jesuit missionaries to introduce Roman Catholicism into their ancient religion. The Jesuits helped organize the eight major pueblos that still exist today near the city of Guaymas. When silver was discovered, the Spanish once again infiltrated Yaqui land. For the next two centuries the Yaquis, and their allies the Mayos, tried to drive them, and later the Mexicans, out. By the late 19th century, bitter warfare, massacre, enslavement, and outbreaks of smallpox forced waves of Yaquis to relocate. Only since 1978 have the Yaquis been a federally recognized U.S. tribe. The Pascua Yaqui reservation is small, under 2,000 acres of desert southwest of Tucson. It often is referred to as New Pascua or New Village, in contrast to Old Pascua, tucked away in central Tucson. The Yaquis interviewed in this book grew up in Old Pascua, attending Richey School. Other communities in Arizona include Yoem Pueblo in Marana, northwest of Tucson; Barrio Libre in South Tucson; Guadalupe, south of Phoenix; Penjamo in Scottsdale; High Town in Chandler; and Somerton, near Yuma. The Yaqui Easter ceremonies, Holy Week in particular, attract hundreds of spectators annually. While viewers are enthralled by the spectacle, the Lenten season, cuaresma, is a religious devotion that touches each Yaqui family. If not a direct participant, everyone has close relatives involved. It’s not hard to see what appeals to the public. Night by night, Christ’s capture, crucifixion, and resurrection are transformed into a dramatic Yaqui ritual of good versus evil. The chapayekas, members of the Fariseo religious society, cover their entire heads in homemade masks of demonic-looking animals, humans-from a Roman soldier to a Spanish conquistador to Richard Nixon-or even cartoon figures, such as a Teenage Mutant Ninja Turtle. While hilarious physical comedians, communicating only through gestures and pantomime, the chapayekas portray evil incarnate. Their sudden lunges scatter children with shrieks of laughter and real fear. Their allies, the Caballeros, dressed in black, march stern and straight with wooden swords at their sides. Arrayed against them are the Good. Angelitas, tiny children in starchy dresses and leafy crowns, fiercely whip the chapayekas with long twigs. Matachinis in floral headdresses of streaming colored paper wheel in formation, to the shaking of gourds and plaintive fiddle melodies. Pascolas in goatish, hand-carved wooden masks shuffle intricate steps, rattling their cocoon anklets, around maaso, the Deer Dancer, who, with a deer head mounted on his own embodies the spirit of the animal itself. To the observer, the festivities can be as dizzying as a runaway carousel, the chapayekas cavorting and clowning to one side, firing cap pistols; to the other, the Deer Dancer stalking to the throb of drums and Yaqui singing. Fireworks erupt. Cantoras wail Latin hymns. Bonfires blaze. Families clatter up and down aluminum bleachers. From the rows of food booths wafts the smoky aroma of fresh chili stew. For all the extravagance of sensation, some of my favorite moments are the pensive ones, a solitary chapayeka removing his mask by firelight, a chat with a former student, 2 a.m., leaning against the root stump of a felled cottonwood. At the climax of cuaresma, Sabado de Gloria, the dozens of chapayekas storm the chapel repeatedly. To the clanging alarm of bells, each wild rush is thwarted by the Good, including families inside, who hurl colored confetti, symbolic of flowers, or real flower petals. In Yaqui belief, flowers spring from the blood of Christ. Spectators join in, smacking open colorful cascarones, eggshells filled with confetti, which they fling at the chapayekas charging by. Whatever one’s faith, the mix of exhilaration, peril, and sheer fun is intoxicating. This is no acting. The people are under assault by evil. You can see it in their grimaces, their fierce throws into the faces of their attackers. Finally, the defeated chapayekas shed their masks and sticks into a fire, already glowing and crackling with a burning effigy of Judas. Once again their human selves, they run across the dirt plaza to rejoin the community, within the sanctuary of the chapel. This is the part that always catches at my throat. After forty days of ceremonies, they are exhausted. They have sweltered in the midday heat, under masks, blankets, and overcoats. Now they are running, when a fall, so I’ve heard, can portend ill luck, even death, during the coming year. Their faces are red, sweating, Then their godparents join them, running alongside, sheltering their heads with a blanket or coat, holding them up by the arms if need be. The chapel welcomes them inside. The Tohono O’odham (formerly known as Papago) are widely believed to descend from the Hohokam, pre-Columbian engineers of vast irrigation systems in the Sonoran Desert. Their modern history alternates periods of peaceful coexistence with active resistance against the occupying powers. Their first European contact probably was the Spanish wanderer Cabeza de Vaca, in the 16th century, but widespread interaction, through Jesuit missionaries, did not take place for another hundred years. While many O’odham congregated around the missions, accepting Christianity and European norms of civilization, at least four major revolts broke out between 1695 and 1776. After Arizona became U.S. territory, Anglo encroachment led to constant friction over land and water rights. The ultimate results were the reservations established in 1874 and 1917, and the Southern Arizona Water Rights Settlement Act of 1982, which resolved a lawsuit demanding restoration of O’odham water lost to urban development. The Tohono O’odham Nation is vast, 2.8 million acres, the second-largest reservation in the United States, but sparsely populated. Of the approximately 24,000 Tohono O’odham, some 11,000 live within its boundaries. The reservation is composed of eleven districts, including two tiny, separate communities far to the north. The San Xavier District, bordering Tucson, is home to both the gleaming, whitewashed mission of the same name, originally built by the O’odham under Father Eusebio Kino, and the Desert Diamond Casino. The main reservation, consisting of eight districts, begins about twenty miles west of Tucson. Its southern boundary shares the frontier with Mexico, a source of considerable grief. Already the border divides ancestral O’odham lands and people from each other. Since 9/11, the Department of Homeland Security has tightened controls, while the Secure Fence Act of 2006 threatens more permanent barriers. Meanwhile, immigrant and drug smuggling overwhelms traditional O’odham hospitality with violence, trash, and the desecration of sacred sites; the stepped-up Border Patrol response scars the land and ruins fences, releasing cattle to menace the high-speed roadways. The reservation, with its miles of empty desert, can take on the appearance of a war zone, law enforcement SUVs roaring every which way. A friend’s granddaughter lost her father, run over and killed by the Border Patrol. I’ve been stopped myself, as a “suspicious vehicle,” by an O’odham cop. “How am I suspicious?” I asked. “You’re white,” he replied, with disarming frankness. Still, the landscape enchants with its rugged mountains and profusion of starkly beautiful vegetation, much of it spiny. The spray of dry thorned sticks known as ocotillo leafs out green, tipped by red blossoms, after a soaking rain. The stately saguaro, with its arms outstretched or writhing, is a person, according to an O’odham story. A mother, obsessed with toka, the traditional stick game resembling field hockey and played by women, neglected her daughter. The child buried herself in the earth, emerging as a ha:san (saguaro), giving its red bahidaj fruit to the people. The mountain Waw Giwulk (corrupted to “Baboquivari”) is the spiritual center of the Tohono O’odham. Visible for miles in every direction, the distinctive granite dome is home to I’itoi, the Man in the Maze prominent in O’odham basketry and jewelry. And elsewhere, apparently; I don’t know how to explain the Man in the Maze pin I encountered at a street market in Florence, Italy. The maze often is interpreted as the journey of life, or also, as an O’odham woman once told me, a metaphor for traditional storytelling. All stories are one story, she said, with each being a part of the maze. It’s like a spider’s web: any part that is struck, the rest vibrates to it. The O’odham Himdag, or traditional way, is woven into the cycle of the seasons. In the past, many families kept winter and summer homes. In winter, they hunted in the mountains. During summer, they farmed the desert in the ak chin method, capturing rainwater to irrigate tepary beans, squash, corn, and melons. At the proper times they gathered cholla buds and mesquite beans. After displaying its creamy white blossoms, the saguaro produced the bahidaj for eating and ceremonial wine. Traditional storytelling is confined to the winter months. Piasts, celebrations, occur throughout the year, and may be the occasion for dancing waila, AKA chicken scratch. Waila bands play an O’odham- flavored hybrid of Europan polka and Mexican norteno. To be caught up in the spinning galaxy of whirling couples, dust rising in a haze from scuffling feet, is both grounding and otherworldly. Nowadays you’ll hear just as much rap, reggae, and hard, hard rock. The tribal radio station, KOHN, beams a mix of music and commentary, some of it in O’odham, across as much of the rez as its low wattage will allow. Leaving the reservation, I know that once I’m alongside Kitt Peak the reception will fade, contesting with an evangelical Christian station. For miles the two will struggle for airspace equally, a burst of sax and accordion alternating with drawl-tinged exhortations to follow Jesus. Both Yaquis and Tohono O’odham prepare really delicious food, including the astronomically caloric frybread, or popover, often topped with honey, or red or green chili. Either color is fresh, roasted green or stewed red, bits of pod floating in it-no canned or powdered. The tortillas-cemait in O’odham-are slightly elastic, moist, dotted with black dots from toasting. They don’t dry out, brittle. Probably loaded with lard. Some of the best food I’ve ever eaten is from the parking lot in Sells, the main Tohono O’odham town, or booths at the Yaqui Easter ceremonies. And both Yaqui and Tohono O’odham suffer the plagues of other tribes, high unemployment and alcoholism, early death from disease, violence, auto accidents, suicide, the looming shadow of tragedy. To survive, my Native friends have attained the toughness and beauty of the hardy desert plants. My plan for Here I Am a Writer was to interview former students, then link those oral histories between their old writings and new pieces. Re-connecting them to the writing habit did not always prove easy, however, and whenever I risked becoming a complete pest I dropped that notion. I’m grateful for the time my collaborators gave me. I deeply appreciate their patience and kindness. It was a joy meeting with them again. Once again I savor memories. At the conclusion of that inaugural ArtsReach reading, Karen and I gathered up the students from the YWCA basement and took them out for pizza. They chatted excitedly, autographing each other’s ArtsReach books. Yaqui and O’odham, tribes living only an hour apart-many had not heard of the other before that event, and now they shared an authors’ signing party. Above all, I think, is the wonder at what the students have made. Over lunch, at times, I’ll spread the handwritten manuscripts around my plate, occasionally spattering them with salsa, as I nod at an inventive passage, laugh, or sit back in awe. Occasionally I must read them aloud, on the spot, to whatever stranger might be nearby. Observing, a waitress once asked what I do. I told her. I’ve chosen the particular lives for this book because they or their body of work intrigued and moved me. In most but not all cases I sought out the people I had known best because I thought they were most likely to talk to me. So either I had intense personal memories of them, as with Marisa Yucupicio, who used to babysit my child, or I’d shared contact with them over many years, as with Patrick Lewis-Jose. Eucario Mendez is an exception; I taught in his sixth grade class a week or two and scarcely saw him again until knocking at his door eighteen years after. Yet I’ve showed off his story, “Mr. John,” to so many classrooms and workshops that it lives in my head. Many brilliant and valued students are not represented here, due, for the most part, to circumstance: I hooked up with other people first. And once I did, I found that the process of interviewing them thoroughly, enough to hope I’d grasped at least some partial truth, was long. I learned that others’ lives do not fit into my timetable. Crises intervened, theirs and mine. I realized that by the time I interviewed all those I would like, the first group would be drawing Social Security. More Tohono O’odham than Yaqui appear, with more extensive portfolios. Again, circumstance. I’ve accompanied several groups of O’odham through ascending grade levels in the Indian Oasis-Baboquivari School District. Wenona Ortegas and Patrick Lewis-Jose, for instance, were sixth graders together, joined in seventh by Josie Frye. I visited their class every year until they graduated in 1997. In contrast, the Old Pascua Yaqui students, after attending their neighborhood Richey School, disperse throughout the enormous Tucson Unified School District, where ArtsReach and I lose track of them.